We are honored to introduce you to Rich, a kind, warm, and soulful man who found a caring community at Schurig Center after surviving a stroke. One seemingly typical day, Rich was in his office when his life changed in an instant. The stroke came quickly and unexpectedly. And, it left him with aphasia, a communication disorder that makes it difficult for him to read, write, and speak. Suddenly, he was unable to live on his own or return to work. Prior to the stroke, Rich operated his own accountancy firm for 20 years and was a graduate of Rutgers University. He led an active and rewarding life. Rich enjoyed being in nature, travelling, and playing in a weekly liar’s dice game with his buddies. He had also weathered some hardships, including the passing of his partner of 30 years. “Terrible” is how Rich describes the months following the stroke. After the hospital, he was sent to live in a nursing facility without a plan or resources to continue his recovery. Unable to return to work and having no children or family members to help, Rich relied on Medi-Cal and disability benefits. One of the trained professionals who helped Rich tap into his potential is our speech therapist, Kalynn. She recognized that Rich’s comprehension and memory are good. But, he can’t say what he wants to say or hear clearly in group settings. Kalynn worked with Rich in one-on-one sessions, and over time, his communication skills and outlook improved dramatically. She also helped John and the nursing facility staff realize that Rich is able to understand what they are saying and that he is capable of much more than they previously knew. A door to new possibilities had been opened for Rich! Today, Rich is involved in many activities that are helping him reach new heights of confidence and greater independence. He attends speech therapy, participates in art classes, receives donated food, gets resource referrals, and volunteers in our organic garden. His friend John also receives education about how to best support Rich as he recovers. Caring people like you changed Rich’s life. Only you can provide more stroke survivors, like Rich, with connection, support, and care when they need it most. Because of caring people like you, Rich is no longer isolated and feeling hopeless. Your support gives Rich the community he desperately needs to rebuild his life with meaning and purpose. 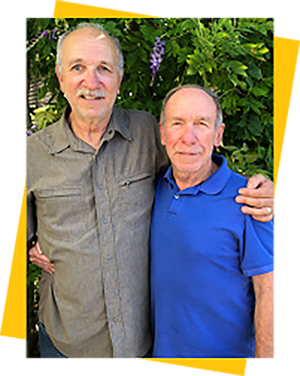 In his words, you provide access to “people who care and know how to tap into who I am.” Every day more calls come into Schurig Center from people, like Rich and John, who are in crisis and who need your help. Schurig Center relies on community support to keep our doors open. We do not receive health insurance payments or federal funds. In fact, 80% of our income is provided by foundations and individual donors. Without you, hundreds of survivors and their family members this year would have nowhere to go for connection, support, and care as they rebuild their lives. Please join us in helping even more survivors, like Rich, not only survive, but thrive.